A Florida resident has contracted a rare-but-deadly bacterial infection, officials with the Florida Department of Health confirmed Monday. The resident of Escambia County caught the extremely virulent vibrio vulnificus bacterium, though officials have not said how. Vibrio vulnificus is a found in salty, warm water and can enter the body through open wounds or from eating raw or undercooked shellfish. Infections are rare, but often fatal, with around one quarter of those infected dying. Less common, but more deadly, are vibrio vulnificus bloodstream infections. These can be fatal about 50 percent of the time, according to the Florida Department of Health. While healthy individuals have little to worry about, those with compromised immune systems and those with kidney or liver disease are 80 times more likely to develop a bloodstream infection. Last year, 46 people contracted the bacteria in Florida and 10 of them died. The previous year, 45 people contracted the bacteria and 14 of them died. So far this year, 14 people have contracted the bacteria, but only one has died. To avoid the infection, the Florida health department warns those with weak immune systems, including those with kidney or liver disease, to be careful around the water and to wear footwear to protect their feet from cuts from shells or rocks on the beach. People with open wounds should stay out of the water and should immediately treat any scratches or cuts they get. There is no evidence of person-to-person transmission of Vibrio vulnificus. 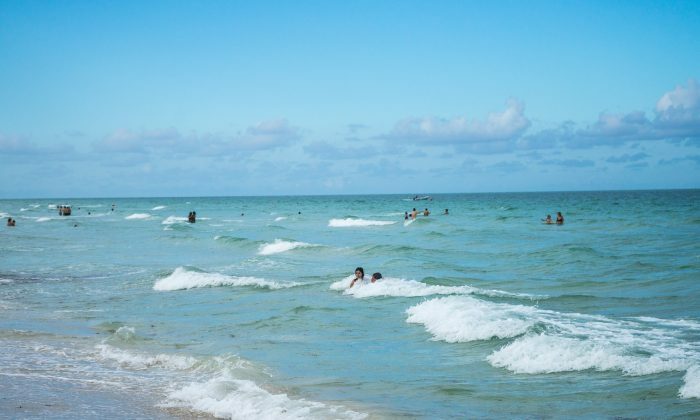 “Vibrio vulnificus is often mislabeled as flesh-eating bacteria, but it is very important to note that it is not flesh-eating bacteria,” said Mara Gambineri, Communications Director with Florida Department of Health. “Vibrio vulnificus is a naturally occurring bacteria in warm, salty or brackish water, so it is present year round in Florida. “Florida’s beaches and waters are safe to enjoy responsibly if you take proper precautions,” she said, adding that the bacteria poses no risk to normally healthy people without open wounds or cuts. Good wound care is the best way to prevent a bacterial infection, she advised. Eating contaminated seafood with the bacteria can lead to vomiting, diarrhea, and abdominal pain. Wound infections due to the bacteria can cause skin breakdown and ulcers. “For patients with wound infections, amputation of the infected limb is sometimes necessary,” warns the department. The best advice to avoid problems is to not eat raw oysters or raw shellfish, including those that do not open during cooking. “Boil shucked oysters at least 3 minutes, or fry them in oil at least 10 minutes at 375°F,” advises the department. It’s also important to avoid cross contaminating cooked seafood by handling it with utensils or exposing it to juices from raw seafood. Visit Florida Health for more information on Vibrio vulnificus.